Are Spring Allergies Forcing You To Stay Indoors? Step out This Spring! Are spring allergies are recurring headache for you? Are you a Washington D.C. area resident who is often shut up indoors – during the most beautiful season of the year – because of allergy symptoms? Step Outside This Spring Season!! We’ve launched the “Step Out This Spring” campaign to educate our community, and to encourage you to get the most out of the 2016 spring season (and hopefully every spring season from now on). This effort is partly about patient education and partly about promoting our local community and its attractions. If you follow the series, you’ll learn more about seasonal (spring) allergies, the most common allergens that trigger seasonal allergies and hay fever symptoms, some natural remedies and other tips to help you control your symptoms. You will also learn why seeing an allergy and asthma specialist could be important for you. Finally, you’ll learn about the only allergy treatment method that actually reduces your allergic response over time – that is, that reduces your body’s response to allergens – rather than just suppressing symptoms. 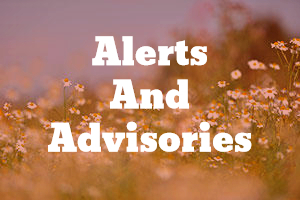 In addition, we will include articles that are uniquely relevant to residents of Silver Spring, Montgomery County, P.G. County and other parts of the Washington DC area – the places where our patients live. We don’t want you to sit locked up in your home or office, while the tourists have all the fun. As part of the series, you will find curated lists of resources for things to do, places to go, festivals and events, that help you enjoy the great outdoors. 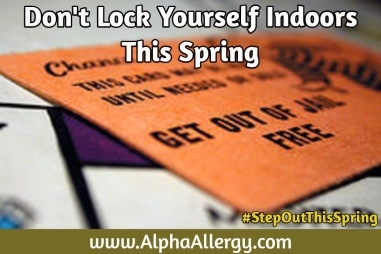 Your Get Out of “Spring Allergy Jail” Card! It’s understandable that when you’re suffering through the classic symptoms of hay fever – the runny nose, constant sneezing, the red, itchy, watery eyes, nasal congestion, wheezing – that you decide to just shut out the world, and stay indoors as much as possible. Many people miss out on the sights and attractions of the most beautiful time of the year because they have spring allergies, and their symptoms are out of control. Or they manage to get their symptoms under control with allergy medications, but can’t work out the exact right medication or dosage for their needs, and are beset by undesirable side effects like drowsiness or fatigue. Feeling stuck between those options, some people just resolve to avoid the outdoors. Don’t spend the 2016 spring season that way. If you’ve tried to be proactive but aren’t finding the right balance for your symptoms, it may help to consult with an expert (see below). It is possible to enjoy the best that springtime in the Washington metro area has to offer, without having to suffer through constant drowsiness, fatigue or “fuzzy brain” from your allergy medication. 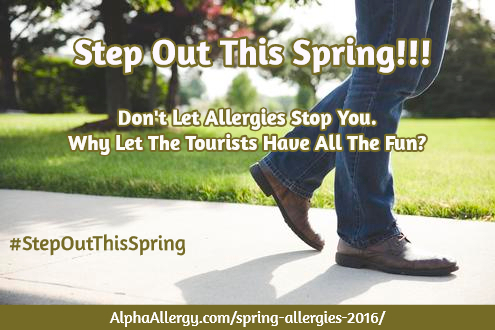 If you need expert help to get spring allergy relief so you get the most out of the spring season, Alpha Allergy & Asthma can help. Our doctors, Dr. Nkiruka Erekosima, and Dr. D’Jahna Akinyemi, are former Johns Hopkins doctors, double board-certified in allergy-immunology and internal medicine. They see adults and children, and you may be able to get a same-day appointment right now. Hay Fever: How Did The Spring Allergy Scourge Get It’s Name? Why Springtime is Tree Pollen Allergy Time, Unfortunately! Spring Allergy Symptoms? Do Something Proactive! Do you know someone else who could benefit from this information? Share this page with them. Do you need to see an allergist immediately? We may have same day appointments available at our Allergy & Asthma clinic in Silver Spring, Maryland. Call (301) 879 – 7700 now to schedule an appointment. Gogo Erekosima is a practice consultant and administrator at Alpha Allergy & Asthma Associates. He writes on topics related to allergies, asthma, healthy living, healthcare customer service, and medical practice management. Please do not send Protected Health Information via this form. If necessary, simply request that we contact you.